Additional Title: "Carlton", near Queen Lane, Germantown. This black and white reproduction of a watercolor painting by T. H. Wilkinson depicts the facade of a large colonial-style mansion in a park-like setting. The two-story stone building is coated in whitened plaster. The central part has an attic with dormer windows on both sides, and a portico supported by six Grecian pillars. 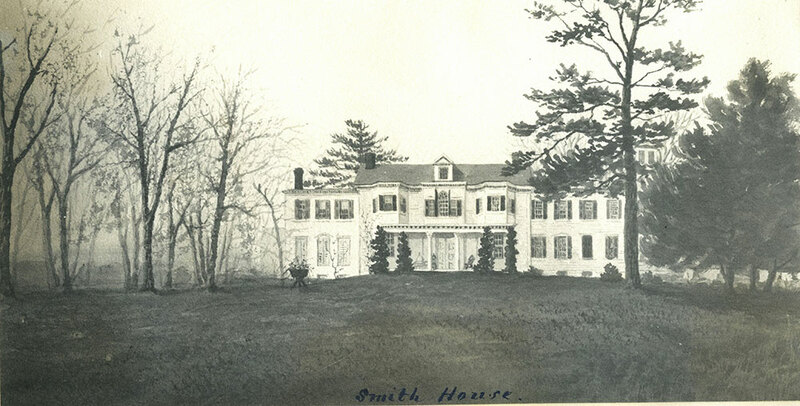 Known as the Smith Mansion, or the Carlton-Smith Mansion, it was built in 1780 by Isaac Tustin high on a plateau above the east bank of the Schuylkill River. It was on this land that George Washington chose to encamp his troops during the Brandywine campaign, and he used the house as his headquarters before and after the battle in August and September 1777. The mansion was purchased by Cornelius Smith who lived there between 1840 and 1880. It was demolished in 1951 to make way for the construction of the Green Lane resevoir.